One week ago, an incredible musical talent and personal hero of mine committed suicide. You might have heard of him; he fronted a band called Linkin Park. His name was Chester Bennington. His suicide occurred on what would have been the fifty-third birthday of his good friend, Chris Cornell, who also committed suicide a little over two months ago, and who was also a musical hero of mine. It's taken a week for me to collect my thoughts about what I wanted to say about this. It's hard to know where to start, and it's caused me to do quite a bit of introspection to sort through these emotions and revelations. Chris Cornell died on May 18, 2017, after hanging himself in his hotel room following a concert in Detroit. For all intents and purposes, he seemed to have little reason to want to die. After separating from his bandmates in Soundgarden, Chris pursued a successful solo career, followed by a stint with another band, Audioslave. A few years ago, he reunited with Kim, Ben, and Matt, and produced a brand-new Soundgarden album. He had a family, including three beautiful children. On the surface, there was no clear reason for him to consider, let alone commit, suicide. In the days and weeks following the death of Chris Cornell, I became affected deeply in ways I couldn't understand at first. Yes, I've been a Soundgarden fan since Superunknown was released in 1994 (when I was the tender age of 10). Yes, I'd followed much of Chris's solo career and enjoyed some of his work with Audioslave. Yes, I was as pumped as any old-school Soundgarden fan when they reunited a few years ago and put out a new album and announced a tour. As many Cornell fans were, I was familiar with his struggles with depression. He was relatively open about them in interviews over the past two and a half decades, and his lyrics told the rest of the story. Just reference songs like "Fell on Black Days," "Black Hole Sun," "Pretty Noose," "Blow Up the Outside World," "Overfloater," "Burden in My Hand," "Like Suicide"--and these are just from their most prominent releases, Superunkown and Down on the Upside released in 1994 and 1996, respectively. His solo career saw a shift in his musical proclivities, but many of his lyrics remained dark and haunted. His final written words to the world were his last tweet on May 17, 2017: "#nomorebullshit." A couple of weeks after Chris passed, and I'd been listening to Soundgarden pretty much nonstop, I fell into what I can only describe as a depressive hold that shackled me down for the entire month of June. It was like a thirty-pound weight materialized in my chest and held me down. I've felt this before, but it had been a while since my depression had reared its head in my life. I had trouble sleeping. I couldn't create--which as a writer, is incredibly frustrating. It wasn't that I had writer's block; I simply couldn't muster the strength or energy to force my brain to make the ideas in my head translate to words. I didn't want to talk to anyone. I didn't want to socialize. I didn't want to see the light of day. My brain was in a dark cave, so I wanted to be in a dark cave too. I wept a lot. It took the looming deadline of a short story for an anthology, and the desire to not disappoint my fellow authors, to get me into gear. It was painful, but it allowed me to, little by little, reclaim my life. What triggered me wasn't simply the death of one of my musical/lyrical heroes. 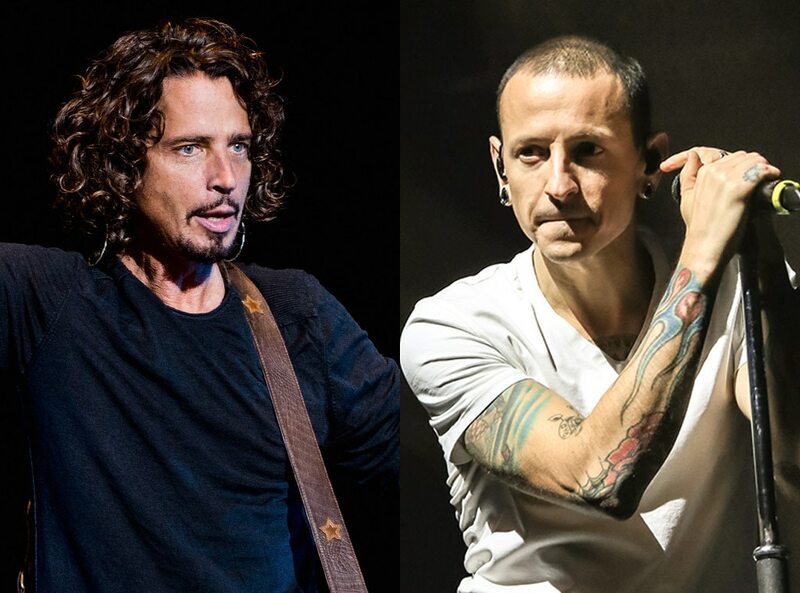 And as I've thought about what did trigger me, since the world has lost many brilliant musicians and actors and artists in general over the past few years, I've realized that while the death of Chris Cornell was heart-wrenching on its own, what triggered me was what it represented for me and other people who battle depression and anxiety. One of us lost the battle--one of us who seemingly had won. One of us who seemingly had everything going for him. One of us who had no reason--outwardly--to suffer. If he couldn't make it, with his lovely family, his ability to make an excellent living from living out his dream, and a seemingly cushy lifestyle--what hope did that give the rest of us? Are those of us who deal with this bound to succumb one day, too, no matter how wonderful life seems? At the start of July, I managed to break the chains that held me. I did things that brought me happiness, like playing video games, a little bit of writing, some blogging, lots of reading. I visited family, and my husband came home from war--so many joyous happenings that helped me get back to myself, that helped me realize that I was bigger than this, that I couldn't stay down because there are people in my life that care about me and who I care about, and who count on me to be strong. Last Thursday, I was randomly checking Facebook when I saw someone's post asking if the headlines about Chester Bennington's suicide were real. My first instinct was, "Hoax." It was Chris Cornell's birthday; we know they were close. Most fans have heard that gut-wrenchingly beautiful rendition of "Hallelujah" Chester sang at Chris's funeral. Most of us saw the incredibly emotional performance of "One More Light" on Jimmy Kimmel days after Chris's death, where Chester occasionally struggled to get the words out, where his bandmates were visibly devastated, where any fan of either band or person with ears and a heart would have been moved to tears. It was no secret Chester and Chris were great friends, and the internet can be a dark and plain old mean place, so of course rumors about this poor guy killing himself would take place. There were no tweets from Chester or Linkin Park chastising the public with "rumors of my death have been greatly exaggerated" statements. There was nothing--except for headlines from multiple news sources, including the often on-the-mark TMZ, stating that the singer had been found dead from an apparent suicide-by-hanging. Finally, the CNN alert flashed across my screen. My disbelief turned to shock. After about fifteen minutes, shock gave way to grief. Not again. Not another one. In a flash, I thought of all my favorite Linkin Park songs over the years that have ever meant something to me, and why they mean something to me: "One Step Closer," "A Place for My Head," "Given Up," "Crawling," "Numb," "In the End," "Faint," "What I've Done," "The Little Things Give You Away," "Leave Out All the Rest," "Shadow of the Day," "In My Remains," "Burn It Down," "Keys to the Kingdom," "Until It's Gone," "One More Light," "Nobody Can Save Me," "Sharp Edges." Like Chris, Chester was very open about his struggles with addiction and depression, both of which are heavy source material for his lyrics. His words had a universal pain to them--anyone who ever struggled with anything can find something to relate to in his words. He had an incredibly powerful roar, but also a gentle, soulful voice. Sometimes, you could hear them both in the same song. He verbalized the words so many of us wish we could say. He gave a voice to those screams that so many of us wish we could unleash. These songs united so many of us dealing with the same mental and emotional struggles--even if no one in our immediate lives understood what we were going through, there were literally millions of other people who did, millions of other people who listened to the same songs and the same lyrics and felt understood. Because the author of those lyrics did understand, and being understood when you don't even understand yourself helps you realize you are not crazy, you are not alone, and you're not the only one suffering. That author is gone now. Linkin Park was supposed to perform in Lincoln February 7, 2015. My husband bought me tickets, knowing how much I love LP, and I was beyond thrilled. That same music, those same words, that I'd discovered a decade and a half before, I'd get to hear in person. That roar, that howl, that scream, that echoed the noises in my head I sometimes yearned to release, I'd hear live. I'd get to shout every lyric to every song, I'd get to unite with my fellow LP fans, and it would be a transcendent experience (if you have ever been to a concert with other superfans, you know exactly what I'm talking about). But sadly, Chester broke his foot, and his surgery took place over a string of concert dates including mine, and was thus cancelled. They never rescheduled. I completed my Master's degree in May 2017. I had no plans of going to the Saturday morning commencement on May 13, but instead agreed to attend the hooding ceremony on May 12th. Then I found out that Soundgarden was going to be in town that same night. One of my all-time favorite bands from my childhood was coming to my city! I debated, but decided that I'd better go to the hooding ceremony instead. Family was involved, and as it turned out, my best friend had flown in from New York to surprise me, so that meant Soundgarden would have to wait until next time. There won't be a next time, now. It may seem silly to some that these "celebrity deaths" have such an impact on people. I can't speak for everyone and their reasons for mourning, for grieving. For me, it's two-fold: these two men were artists, poets, and their work resonated in my soul. The power of their words inspired me to write my own. Their music was a soothing balm for when the rest of the world just didn't or couldn't understand what tormented me; when I couldn't understand. They expressed things I wanted to, but didn't know how. And also, these men battled the same thing I did--depression, anxiety. Some days, when those two things are going strong inside you, it's really a toss-up of who's going to win and how bloody the battle will be. Some days, you're the victor. Other days, they seem to be. But Chris and Chester were supposed to have been examples that you can push past even the worst times in your head and in your body to rise above, to push on, to keep fighting. They were examples to show you don't have to be held back from your dreams, that you can fight for what you love and be successful and be loved and have it all. They were supposed to show us that you can win. You can always win. Despite their deaths, despite my grief, and that of so many others', I still believe you can win. I have to believe this. There is too much good in this world for me not to. There's so much worth living for, and they're all "small" things. I don't make millions of dollars. I don't live in a mansion, I'm not famous. But I have family and friends who I cherish. I have pets I adore, who delight me on a daily basis with their mere existence. I have dreams worth fighting for as hard as I can to achieve. I have corners of the world to discover. There's still tons of créme brûlée and pizza to eat, so much wine to drink. So many miles to run, so many steps to dance. There's countless holidays and birthdays to celebrate, vacations to take. There are boundless smiles and hugs to give and to receive, so much laughter to share. Books to read, movies to watch, video games to play, stories to write. Songs to listen to and sing along with, and remember. The hallways can get really dark sometimes. So dark, I'm not sure if I can find my way out. But then I remember that there's got to be a corner to turn if I just keep walking, and if I can get there, I can find one more light. Rest in peace, Chester and Chris. If you, or someone you know, is struggling with depression and considering suicide, please, please, reach out for help. It's there.